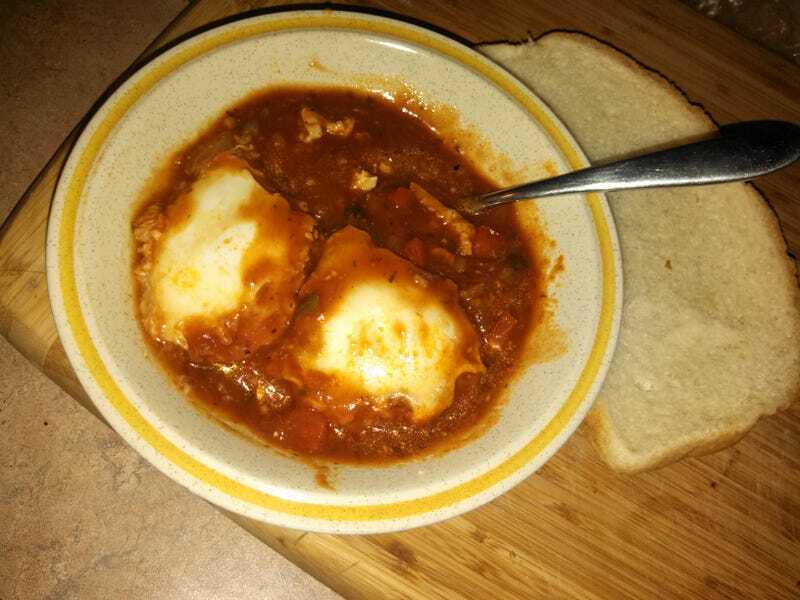 Eggs poached in spicy tomato sauce. Aka, eggs in purgatory. Aka, YUM! 2 of the kids refused to even try it, my 9 year old loved it, Husband and Other-Husband both thought it was delicious, and I all but licked the bowl. I had fresh jalepenos from my bestie's garden, and tomato sauce I canned last summer, frozen bell pepper strips, and fresh mushrooms and garlic. Chop the veg, fry in some olive oil, stir in the sauce. Once it's bubbling, crack a half dozen eggs into the sauce, cover, and simmer about 10 minutes. Devour with some good bread, or just grab a spoon!